In January 2000, artist Julie Green was working at the University of Oklahoma when she noticed an unusual menu in her morning paper. At the time, Oklahoma had the highest per capita execution rate in the country. And the morning after an execution, newspapers statewide would post death notices, detailing the inmate’s life and crimes, the time and manner of his or her death – and the final meal. Green knew about capital punishment, but the tradition of offering the condemned a special final food startled her. She clipped that menu, and other notices as she found them. 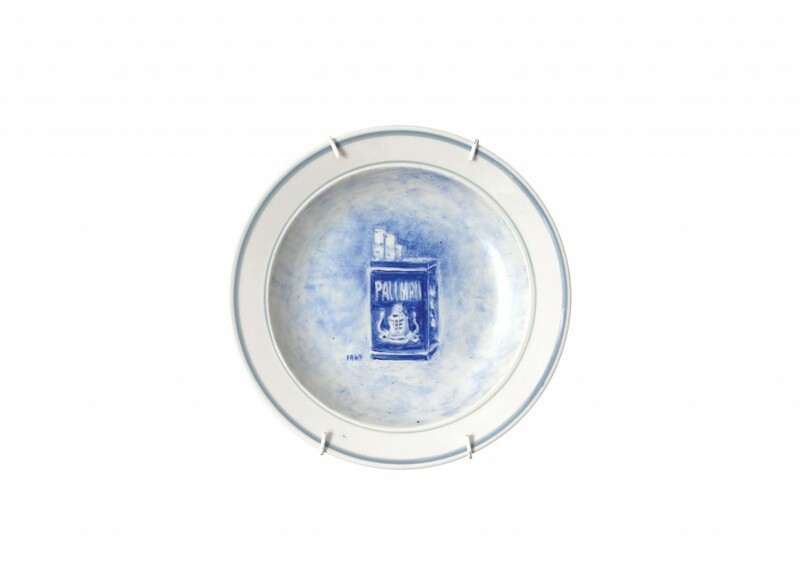 And soon after, she began painting the details of these meals onto second-hand porcelain plates, using a cobalt blue that reminded her of traditional English and Japanese china. Learning about the final meals “humanized the inmates on death row for me,” she told Art Beat in a phone interview from her studio in Corvallis, a city south of Portland, where she now teaches at Oregon State University. If she couldn’t find a final meal listed, she’d call prison wardens for the information. After she moved to Oregon, in 2000, she scoured the web for information about executions across the country. Final meal information nearly always came up quickly in her searches. 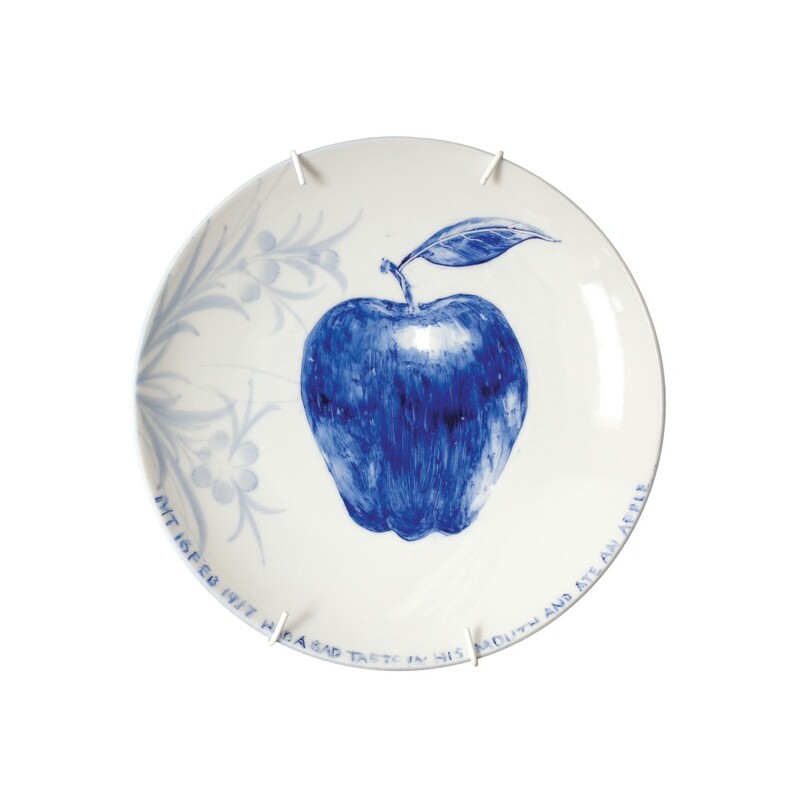 Over time, she delved into historical records to paint older final meals, too, like the single apple given to a man in Montana in 1917. She spends six months of every year on this project, sometimes churning out a plate a day in her quest to create 50 a year. 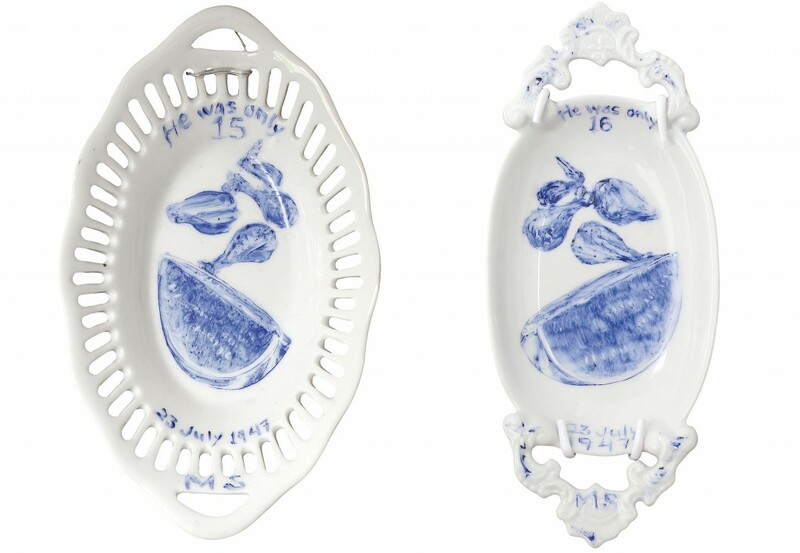 To date, Green has completed 600 plates, which will be on display this spring at the Dayton Art Institute in Dayton, Ohio, in conjunction with The University of Dayton, in an exhibit titled “The Last Supper: 600 Plates Illustrating Final Meals of U.S. Death Row Inmates”. Art Beat: Is your goal to cover every last meal? 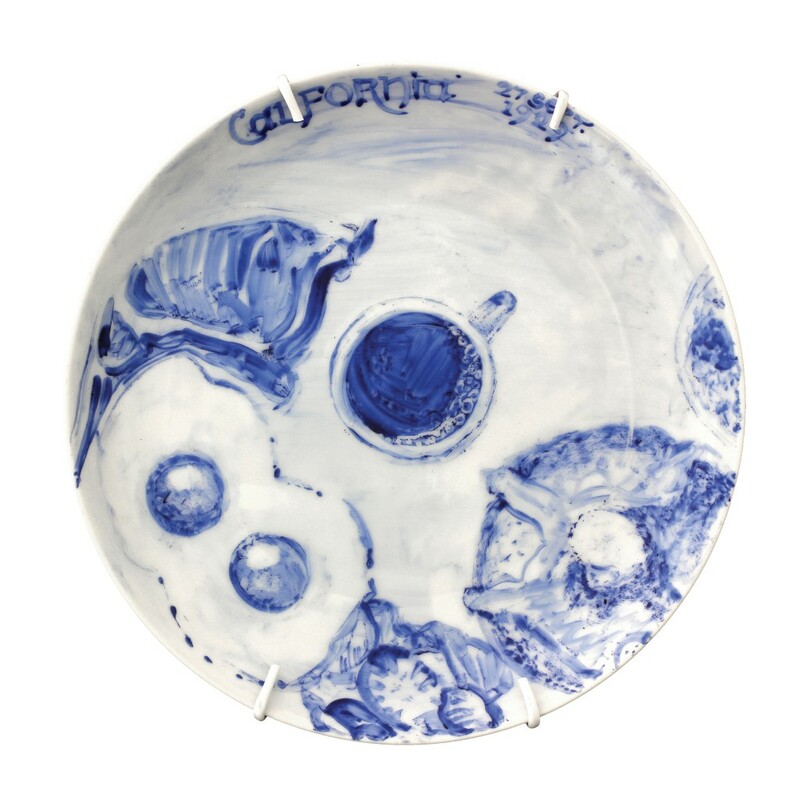 Julie Green: The goal of the project is dialogue, and then to continue to show the plates. I’m looking for longer-term exhibitions, ideally a year, because the transport of 600 or more plates is challenging. Those are my goals, dialogue, and to continue to exhibit the work. 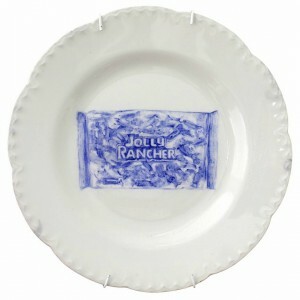 Then, it’s my plan to continue to paint 50 plates a year. Those would be both contemporary executions as they happen, and then I also go back and do historical, very early ones as well as ones I’m behind on. I try to do an overview … to keep it somewhat appropriate, so that the project has a lot of executions from Texas and Virginia, since those have the highest number in the country. But my goal is grander than your question. 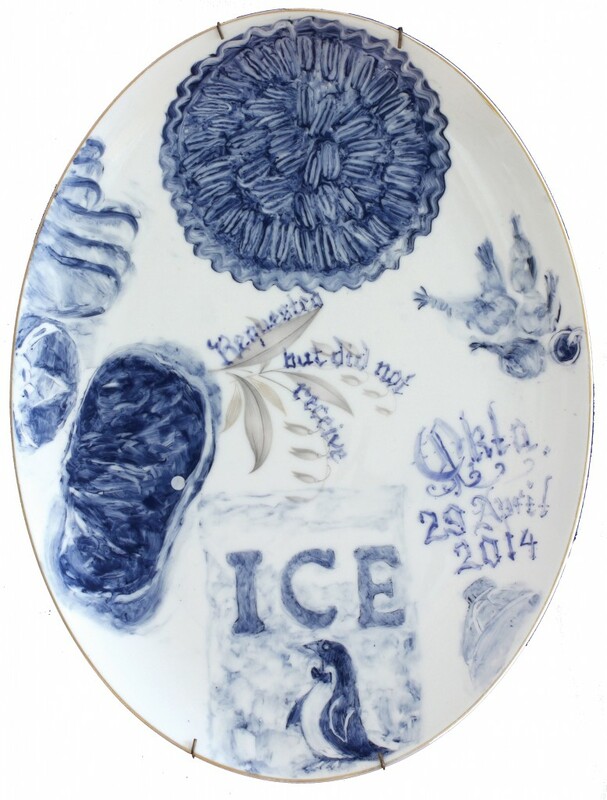 My goal is to be part of the conversation of capital punishment, and to stop painting plates, to end the project. 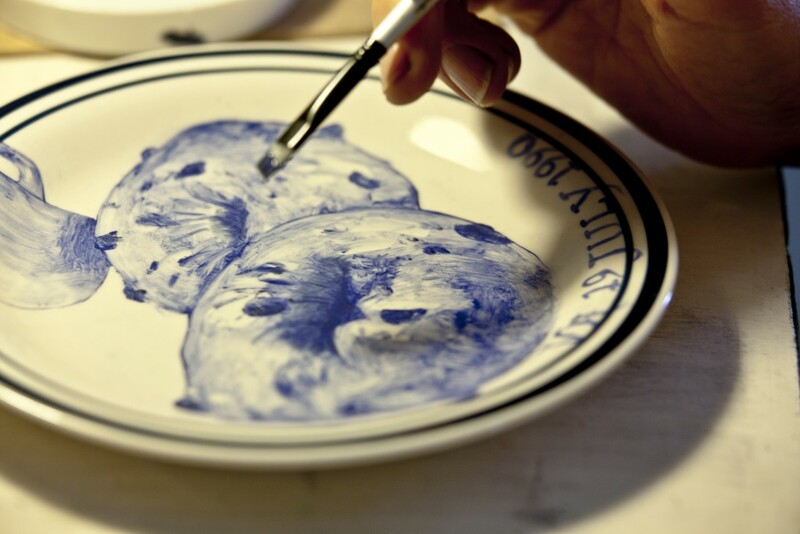 Julie Green applies cobalt blue mineral paint. Her technical advisor, Antoni Acock, kiln-fires every plate. Photo by Ha Lam, Whole Foods Market. Art Beat: So you have political ambitions for the project? Julie Green: It’s actually important to me that the piece is presented neutrally … So while I am political in the piece, you can’t really tell people how to think, and my idea here is more to just point to our system and the meals. Art Beat: What does the tradition of offering death row inmates a special last meal mean to you? Julie Green: That’s a question I’ve thought a lot about, why we have that tradition. Our prison system is sort of based on Europe, and specifically England. That goes back to the gallows and the last beer. That’s certainly historical all over the world, actually. But I think the reason we continue the tradition is perhaps that it is something positive for the prison to focus on [for] its reputation. Art Beat: You identify each inmate by state and execution date. Why do you choose not to use their names? Julie Green: When I first read the meals in the paper, I was struck by how much they humanize, how personal they are. There’s a saying in painting, and maybe in life, too: “When in doubt, leave it out.” For my project, it wouldn’t add anything to have the prisoner’s name. I’m pointing to the state much more, and then the date. At this point, you can look it up if you’re curious, but I’m more interested in the system than in the individual. I didn’t really want to point to the family of the inmate, and also, for the same reason, [to] the victim. I think about all the sorrow that that might represent, a murder and then an execution. There’s so much attached to each plate that I didn’t feel that I needed to add that. Art Beat: Have any meals in particular stood out to you? Julie Green: Some of the really humble ones stand out, like a Honey Bun, or a bag of Jolly Ranchers, or a jar of dill pickles. Those are not the common ones, there are a lot of huge meals that are more common, but those quiet meals stand out to me. There’s a birthday cake and a pizza. The inmate said that he’d never had a birthday cake, so they made a birthday cake for him. 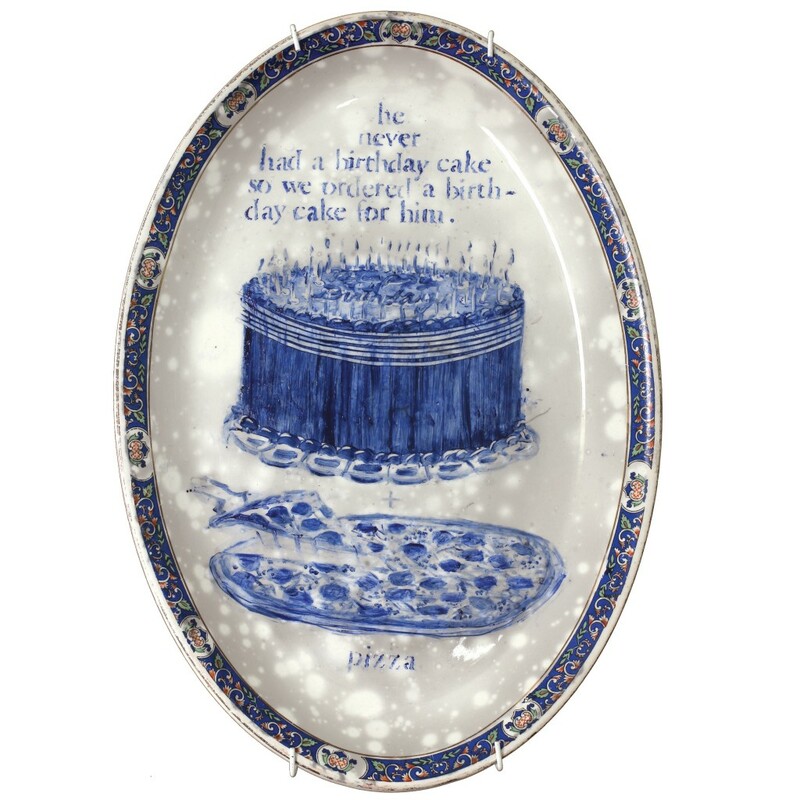 For me, I think all the plates tell a story, but that one tells a bigger story about the circumstance and childhood of that person who’d never had a birthday cake. Art Beat: Have you learned anything surprising about the practice of administering final meals? Julie Green: There’s a lot of state-by-state variations. The ritual, the eating of the meal varies a lot. Sister Helen Prejean has written some fine essays on this process that has influenced me. In Louisiana, you’ll have a meal with family and friends and the prison warden — they’ll all eat together. That’s an anomaly. That’s the only state I can think of that’s like that. Most often, the meal is eaten alone, or with a guard, perhaps. And then even the rituals of having a cigarette; you’re not supposed to have a cigarette, it’s illegal, and alcohol is illegal. I think about that, the variations from state to state, or the relative standards from state to state. Art Beat: What kind of reactions have you gotten from people who have seen this work in the past? Julie Green: I have a comment book. Part of the reason I started the plates was, I realized people don’t know about this, and it’s of interest to them as it is to me, and people also are not informed that well about capital punishment, but they’re opposed simply because of the cost of it or whatever. The comments, sometimes there are several hundred comments for each exhibition. I really encourage people to write them down. It’s really fascinating, keeping all of them. It’s kind of a document of … say, Chattanooga, Tenn., or Chicago, what that particular region that year, who went to the exhibition feels about it. And it does vary quite a bit. [University of California at Santa Cruz] is more of a liberal audience, as you would expect. And then sometimes there are angry people, the full range. Angry is not the right word, but people opposed to the project, or opposed to capital punishment. And that’s great, I want conversation. Usually their responses are actually not about the meals but often go into our feelings about capital punishment. People seem to want to express their views or think about it out loud. And that’s been great. Art Beat: Do you feel that you provide a venue to start those conversations? Julie Green: I hope so, and it feels that way. I’m an optimistic person, and it’s been far more conversation than I even hoped for. And it helps sustain me to continue. Because it’s a sad project. I’m ultimately hopeful, but it’s not light, happy painting. So to see this conversation I think is really healthy, and it definitely helps sustain the project. Art Beat: You’ve said you want to keep doing this till the death penalty is abolished. Do you foresee that happening in your lifetime? Julie Green: Yes, I’m hopeful that it will. Even in the years that I’ve been working on this, a number of states, including the one I live in now, Oregon, either have stopped having capital punishment or have a moratorium. So I think as a country we’re really looking at it. So I am hopeful. Editor’s note: this article originally stated that Corvallis was located in southern Oregon. Corvallis is actually in central Oregon, in the Willamette Valley. The corrected was made on Feb 25.